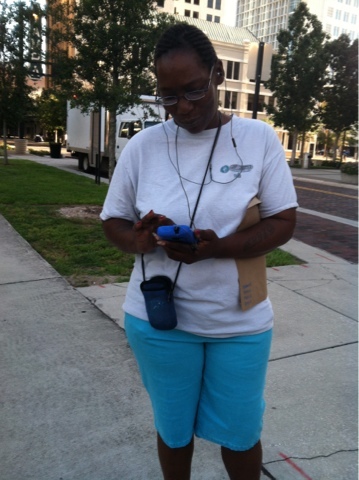 Rolling the world along the walkways of Franklin Street toward Tampa City Hall, I locked eyes with a woman. She had ear-buds and was holding her phone on her hip. I hadn't noticed she was singing to herself. When I said "Good morning" to her, as I do with everyone, she took two abrupt steps to the side. She, now blocked my way, increased her volume and began singing to me. She finished her song and slowly marched in step with the melody that only she could hear. Using her arms and expressions of face and hands she poured herself into the song's finale. Not missing a beat she sang to me, "I have a song for..." She motioned expressively with her arms toward the world. She marched in place, to her own rhythm, only breaking eye contact when I gave her an affirmative nod that I'd listen to her ode to the world. Taking her phone from her belt, she scrolled for her song as she marched. I am no musician, nor am I Ulysses, but this woman was painfully off pitch. The song was obviously her own..